Chestnut cake or Ardéchois is an amazing recipe that will surprise your guests. It is easy and will hit the spot at craving-o-clock, what do you think? Get this… I have been making this recipe for about at least 20 years. And I am sharing it just now. I know, I am sorry, you’ll be even more mad at me after you tried it. Mélanie, why are you giving it just now? I am sorry. 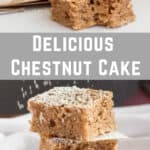 This chestnut cake is offering moisture, sweetness but not too much, just from the spread. There is also that buttery nutty taste…. Guys, just try it. I am torturing myself describing it and I don’t have any to bite into. Tor-ture. Sight. If you are not big on chestnut spread, no worries. Give it a try regardless, chances are you will like it. Hubby, El Cubano, did. And other persons have too. I love chestnut spread, they used to sell it in a tube, like a toothpaste tube but smaller. I would eat it just like that. Not the best idea maybe but if may remember recess breaks and my snacks through taste? This and condensed milk. Hi Sugar-rush! This recipe makes me nostalgic of those years, those people I baked it for. The taste brings me back in my parent’s kitchen in France. I sound very sentimental but living far from your family does that to you. Thankfully, I found a marvellous hubby, El Cubano, and our mini-superman and mini-princess are perfect. Now, those pumpkins are the ones I share my nostalgic recipes and create new ones. They love it and ask for more. It is the best reward after spending time in my apron! Where to buy chestnut spread? About the Chestnut spread: I might not have seen it in every single supermarket but it is quite common in the aisle of jams and chocolate spread. Or, you can go to France to pick some up and do your Ardéchois. - In a bowl, put the wet ingredients: eggs, butter previously melted, the chestnut spread and milk. Mix well. - Add progressively the flour and the baking powder, mix until smooth. - Pour the mixture in an oven dish,previously buttered if necessary. - Bake in the oven at 385F for 30-35 minutes or when the tip of your knife comes out dry when you pick your cake.